Bears tight end Trey Burton is being slightly undersold as a fantasy football option. To sit here and pretend that Bears tight end Trey Burton and Chiefs tight end Travis Kelce should be compared from a fantasy perspective (or most other perspectives) would be misguided. Kelce is an upper-echelon tight end with a four-year history of productivity that puts him in a class only surpassed by Rob Gronkowski. Burton is getting his first opportunity at starter's reps after four years as a reserve for the Eagles. Burton's numbers are bound to receive a significant boost as a featured piece in an up-and-coming offense we just don't know how large of a boost. Meanwhile, Kelce is established. However, trying to project what Burton might become does require us to explore how the two are intrinsically linked as tight ends that fell from the Andy Reid tree. In terms of the way they'll be utilized within their respective offenses, we know the two can be used similarly in terms of alignment to create matchup problems. Kelce was a key to Nagy's offense as the offensive coordinator of the Chiefs and Eagles coach Doug Pederson is also a former disciple of Reid too. Though in a more limited quantity, we've seen Burton do a number of the things that Kelce does. You can move them around to isolate them against either smaller or slower defenders, forcing defenses to make difficult schematic decisions that can be exploited. Even if it doesn't mean that Burton is meant for Kelce-like numbers, we can still use Kelce's level of involvement in the Chiefs offense along with Burton's history of productivity to get a more accurate sense of where Burton might fall among fantasy tight ends. Over the last two seasons, Burton has played in an average of 314 offensive snaps. In the Chiefs offense over the last three seasons, Kelce has played in an average of 893 offensive snaps. Even if Adam Shaheen and Dion Sims cut a little further into Burton's reps than Kelce has had in Kansas City, it's reasonably safe to assume Burton will be on the field for 750 snaps or more if he's healthy. And Burton was actually more involved in the Eagles passing game when he was on the field than Kelce was in the Chiefs passing game. __More: [Adam Shaheen turning into pockmark for Bears](https://www.betchicago.com/adam-shaheen-pockmark-bears-ryan-pace)__ Burton was targeted in 14.5 percent of the snaps he's played for the Eagles in the last two seasons while Kelce has been targeted 12.8 percent of the snaps he's played since 2015. With similar involvement in the Bears offense, Burton's numbers in Philadelphia should actually project to the larger sample size. Which means he's being undersold in most fantasy circles. NumberFire [projects](https://www.numberfire.com/nfl/players/projections/trey-burton) 52 catches for 599 yards and five touchdowns for Burton this season, which would have made him the No. 10 fantasy tight end in the NFL in 2017. The composite fantasy rankings at Fantasy Pros rank him as the No. 9 fantasy tight end heading into the 2018 season, but average draft position actually makes him the 10th tight end off the board. However, if Burton is as productive as he was in Philadelphia over 750 snaps a game, he'd be on track for 72 catches for 691 yards and seven touchdowns. If he's on the field as much as Kelce has been for the Chiefs, those projected numbers grow to 84 catches for 805 yards and eight touchdowns. That would have made him the No. 4 fantasy tight end last season. Of course, there are other factors in play. 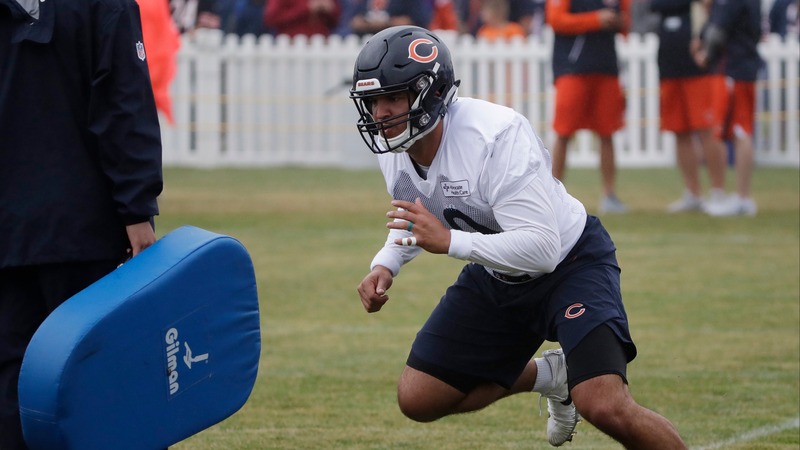 Burton's success is dependent on Mitchell Trubisky's continued development, Nagy's success as a head coach and how many targets there are to go around in an almost completely new Bears offense. But those projections illustrate the potential he has to enter the top of that third tier of fantasy tight ends. There's certainly risk involved too, which is why you'll want to hedge that investment with a solid TE2 who you might give you some value in preferable matchups. Still, with a current average draft position of 95, Burton might be significantly undervalued as a potential top-five tight end.